Ola Ola mes petits monstres. With a new theme this months Fashion Limited Store gives us a look on the theme Nature. The scenery is from TREIZE, a new brand on the grid with sceneries for you to take your pictures in. The New Decor Scenary by TREIZE comes with a handy menu, which makes you toggle between poses and it allows you to rotate and re-adjust your poses. Fit for every mood and avi y TREIZE. 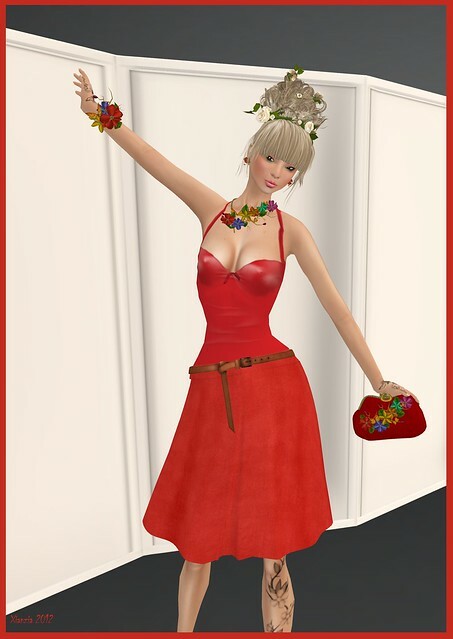 Also for Fashion Limited this 17th edition is AMERICAN BAZAAR, with a beautifull red dress called “BE MY TANGO”. The skirt part is made of mesh, while the top is made with a genuine layer. This makes it a perfect fit. The mesh skirt comes in several sizes, perfect for everyone out there. Combined with a jewelry set made of colorfull flowers, is “NATURE BLOSSOM” from CARA MIA DESIGNS. Also a mesh bag is in this set. One WITH animation, and one without. The hair is by EMOTIONS, called SUNSHINE AND ROSES, it comes as a set of both blonde and black with matching hairbase. The hair is a wild updo with classic long bangs. Around the updo comes branches of roses with nature color, white green and brown. Sadly this hair has already been sold out, but no reason to check other designs by EMOTIONS, for there is lots out there in the same style down the mainstore. Check out this and other novelties at Fashion Limited Store. Reblogged this on Fan Shopping Chat.